JBC Tools RMSE Complete Rework Station with Electric Pump. The JBC Tools RMSE-1C is the quickest and safest solution for soldering and rework, also using Hot Air. It consists of stackable modules and all the necessary accessories to make your job easier. the JT-TA Heater Hose Set and is compatible with most JBC tools. 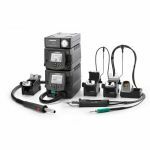 Choose a JBC Tools RMSE-1C Rework Station Today.